14k white gold panther pendant with 2.75 ct of black diamonds, with a 18" chain. Exotic elegance. 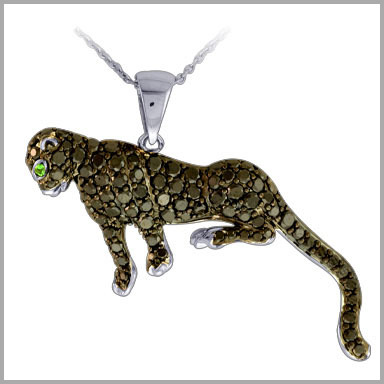 Crafted from polished 14K white gold, this panther pendant is a beautiful way to add a bit of animal magnetism to your wardrobe. It features 98 round full cut black diamonds with a weight of 2.750 ct, while the eye glow with one round 0.020 ct tsavorite in chanel settings. This pendant measures 1-1/8"L x 1-1/2"W with a single bail and includes a chain secured by a lobster claw clasp.